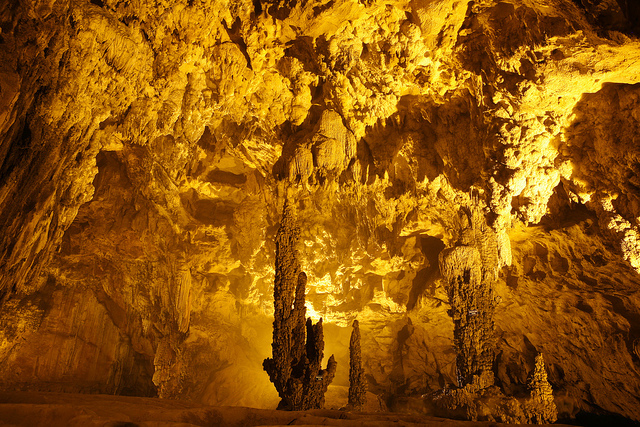 Commonly described as the most beautiful cave in Vietnam, Nguom Ngao cave (Tiger cave in English language) was discovered in 1921 and was developed for tourism in 1996. It is recognized as a national scenic spot according to Decision No.95/QD-BVHTTDL of January 24th 1998 of the MOCST. The cave is located in Gun village, Dam Thuy commune, Trung Khanh district, 5 km from Ban Gioc Waterfall. Nguom Ngao cave is developed in limestone of the Na Quan formation (D1-D2nq). The cave has several branches trending in a general NW-SE direction. The surrounding karst terrain is peak cluster-depression located on a planation surface at an altitude of 400-600m, with many hanging valleys and sinkholes. Within the cave are various chambers, floors, steps and lobbies of many sizes. Speoleothems of various forms are abundant, imitating corals, ships, gold and silver cascades, upturned lotus flowers, individual rock pillars and terraced rice fields. An underground stream with gravel deposits several meters thick flows to the Quay Son river. Its echoing sounds, like the roar of tiger, give the cave its name – Nguom Ngao. Recent survey (2015) shows that Nguom Ngao has an overall length of 2,769.6m and is 61.1m deep, with two floors: one active at stream level and the another dry, about 50m above the stream. The cave has five entrances at an altitude of 420-507m asl. The cave management Board has opened only one section of 945,8m with two entrances for tourism but there is a plan to expand this in future. Alongside Nguom Ngao cave is the Ban Thuon cave, which is located at Phia Pang mountain, Ban Thuon village, Dam Thuy commune. 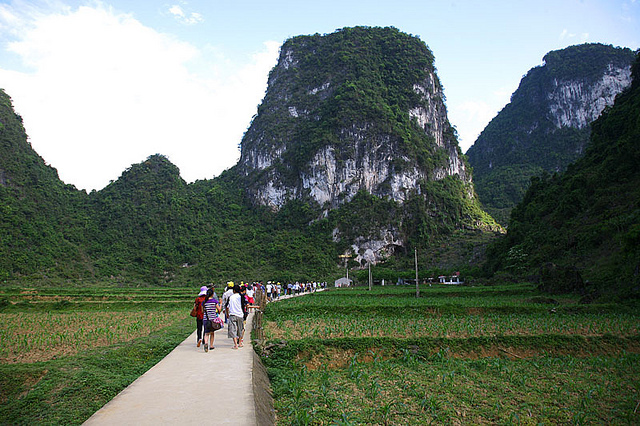 It was recognized as a provincial scenic spot by Decision No.2408/QD-UBND of December 30th 2013 of the Cao Bang PPC. 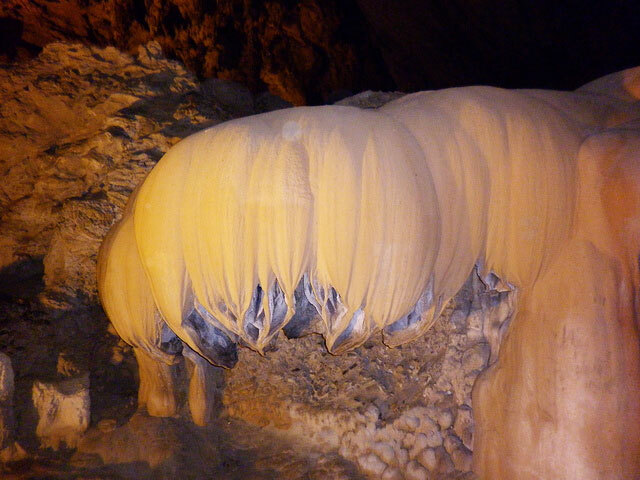 This is a dry cave 500m long, varying in height from 5 to 50m. 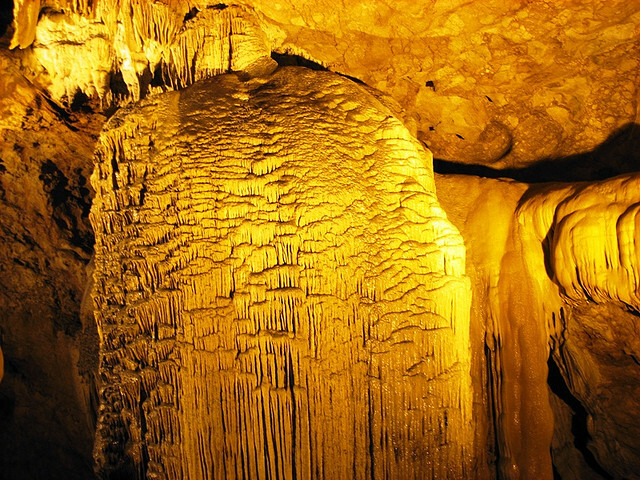 The huge cave chamber is impressive with spectacular speleothems of various shapes and sizes. The Nguom Ngao and Ban Thuon caves combined represent a continuous and multi-stage cave development process. These large-scale, magnificent caves are subject to sound conservation and use as tourist destinations. The caves are characteristic of mature and old stages of karst evolution in tropical conditions. They are of international significance for science, conservation and tourism.